The FTSE 100 Futures are trading at 7,250.05 for up with +0.64% percent . The CAC 40 Futures are trading at 5,304.15 for up with +0.70% percent . The DAX Futures are trading at 12,507.90 for up with +0.56% percent. The EURO Stoxx 50 Futures are trading at 3,578.21 for up with +0.52% percent . European shares kicked off the first trading day of May with gains underpinned by healthy corporate earnings, and manufacturing data added to evidence of a robust underlying economy in the region. With about a third of the MSCI Europe having reported first-quarter results, corporate profit growth in the region was running neck-and-neck with the healthy clip seen in the United States. Overall, for the first quarter earnings in Europe are seen growing 13.9 percent, according to Thomson Reuters I/B/E/S. 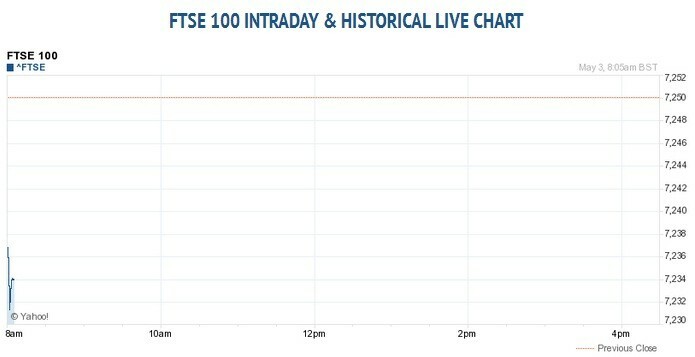 For the day the FTSE 100 closed at 7,250.05 for up with +0.64% percent. France’s CAC 40 closed at 5,304.15 for up with +0.70% percent. Germany’s DAX closed at 12,507.90 for up with +0.56% percent. For the day the Dow are trading at 20,949.89 for up with +0.17% percent. The S&P 500 are trading at 2,391.17 for up with +0.12% percent. The Nasdaq Composite are trading at 6,095.37 for up with +0.06% percent. In other parts of world, Japan’s Nikkei 225 are trading at 19,445.70 for up with +0.70% percent. Hong Kong’s Hang Seng are trading at 24,696.13 for up with +0.33% percent. China’s Shanghai Composite are trading at 3,133.70 with a loss of –0.32% percent. India’s S&P BSE Sensex are trading at 29,916.50 with a loss of –0.02% percent as on 12:07 PM .